ATM Fraud or Cash Money Theft is as old as the machines themselves. It can have very devastating effects on the victims, still it is not considered as one of the major fraud threats. When you enter your credit card into an ATM machine and provide the proper PIN number you get directly linked to your bank account. 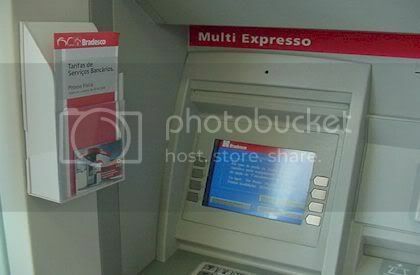 So from this you can see that if you became a victim of ATM fraud, criminal must have had both of these. It is up to you alone to protect your credit card and PIN number to avoid financial loss. 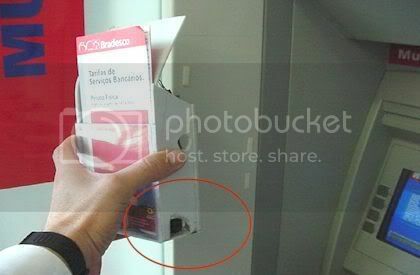 Card Jam – The ATM Machine has been tampered for the sole purpose your card would get stuck in the machine. Once you would leave your location to get help a thief would appear and steal the card. Card Swap – A skilfull quick finger will swap your card without your notice. Violence – Where a thief will physically attack you and mug you. Damaged ATM – Complete destruction or intentional damaging the defensive mechanism of an ATM machine. Once the machine is opened the money is taken from the boxes. Altered ATM – This scam is performed on an original ATM machine but two items were cleverly disguised to appear as if they were part of the normal equipment. 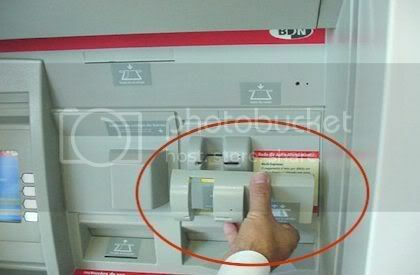 Without closer inspection you can’t recognize that the ATM is about to give information to a thief. First part is the skimmer and second one is a camera and radio transmitter. Looks like a normal cash machine. 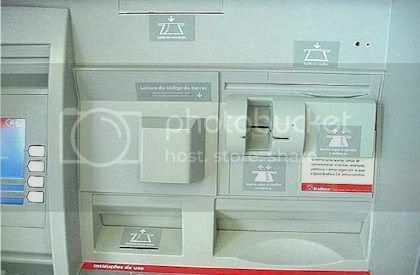 What you don’t see at the first moment is that a skimmer (a false credit card reader) has been installed on the machine. This skimmer will now gather personal information and transmit it to the thieves in a near location, usually in a car. Information will be used to make a clone of your card. To the right we see a plastic holder for envelopes or ads, but hidden on the back of it there is a tiny little camera which captures the moves of your fingers when you are entering the PIN. Scammers have now obtained both, a credit card and PIN number and you haven’t even noticed it. All they need to do now is make a clone of the card go to the next ATM machine and empty the bank account. Check to see if anything has changed on your machine! Tips for safety:When entering the PIN close teh key pad with ur free hand. Is it possible for an atm machine to incorrectly charge you twice? Recently, I tried to use a machine in seattle and at first it gave me a receit saying the machine was temporaily down. I tried it a second time and it dispensed twenty dollars but when i checked my account, it showed I had used it twice for a totlal of 40.00. This has happened before but I always discounted my fears by thinking that this mistake could not happen. Am I losing my mind or is this possible and what can i do about it. The only other expalnation is that I used it twice and forgot about it. its definitely possible that the machine may have a bug in the system. Something similar happened to me twice in my life, but the difference is that I had benefited from this lucky occasion. I have been standing near the ATM. I have been there waiting for someone and I could clearly see that no one was there at the machine for at least 5 minutes. Suddenly I hear a squeaky noise behind me. When I looked back I saw that the machine just spilled out 20€. I went to a atm machine and went thru the normal process as I have been there before: Push my card , thru , ask for id number ( PIN), request How much I want to withdraw ( 100.00), for what account to draw, and finally, request if you will approve a charge of 4.99– you answer Yes and wait . The screen come back and says your transaction was incomplete. There are no transactions that took place. Try it again and same thing happens – except request for 80.00. The screen comes back and says your transaction was incomplete and no transactions have been taken place. That night I look at my checking account balance and it clearly deducted 104.99 and then 80.00 without the service charge of 4.99. There is no way any one would have received 80.00 from the ATM machine unless there was a 4.99 charges. Therefore I am out 184.99. Clearly the recordation of that particular transaction deducted the 184.99 but where is the money going? There is an overage of transactions or someone recieved more than they requested. The ATM machine DID NOT Issue any funds yet it deducted 184.99 from my bank account. Has any one expereience this or is this the first time scam? So I went up this ATM the other day and found it strange that it never gave my card back after inserting it in the slot. There was no screen on it or even a keypad, just a strange round thing and one single button. Frustrated I began pushing the button when the whole machine opened up and a man holding my card said he found it on the floor and wanted to know why I was ringing his doorbell. I just don’t understand technology these days. who do you contact if you are a victim of credit card fraud …should u contact your bank or the police?? and what can be done to catch the frauders??? The device comes with user instructions and a CD with software. This data can be saved / loaded as text files by using the “Load” and “Save” buttons Now select the track, you want to write the data to (Destination) and select the reference track you have formatted in Step 1.If you have any question, please do not hesitate to contact us. Is it possible for someone to clone your card weeks before actually taking the money out of a close by cash point?? ?